Glenn Harrison knows all about the ups and downs of using prosthetic legs. At 57 he’s had a life-time’s experience of limb fittings, pain and the associated problems artificial legs can bring. As a child, and then as a teenager, Glenn’s numerous visits to hospitals such as Roehampton and Great Ormond Street meant that he lost out on education and found himself behind, academically; but this didn’t stop him achieving his ambition of becoming a haulage contractor, like his dad, and getting his Class One HGV licence. 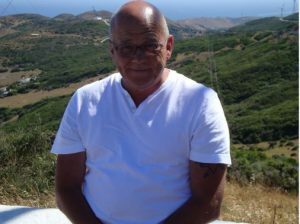 He’s driven lorries, without adaptations, all over Europe and had a successful career in and around haulage until 15 – 20 years ago when he developed cellulitis as a result of many years using the old style ‘Number Eight’ prosthetic legs. Nowadays Glenn is enjoying a great social life and his passion for greyhound racing. He has shares in six racing greyhounds and has two retired dogs himself. Getting the new legs wasn’t without its trials but they have transformed Glenn’s life, both physically and personally. Here’s his truly inspiring story. “In the early days, limb fitters wouldn’t really expect you to have that much mobility with your legs – they helped you walk but that was it. I fell out with my fitter because I was in pain and they said they couldn’t do anything for me - it’s very different now. She was amazing, she had a completely different attitude. We sat there for 2 hours once, trying to get one of my legs to stop squeaking! I was ready to give up and try a bit more at home but she was determined that I wouldn’t leave until the squeak was sorted – that was a real turning point. We got on so well, over the years, that when she transferred from Nottingham to the Seacroft Hospital in Leeds, I transferred with her! She’s emigrated now, though, and that was a bit of step too far so I started working with Helen who’s just like her. She’s a diamond. “It took a while to get used to the changes the new legs bring. The leather side bars on the number eights did all the work for you and gave you stability; you didn’t have to engage your muscles to use them. As a result of that the muscles waste away. © 2017 The Thalidomide Trust.